Fr. Douglas Dayton served in the Episcopal Ministry for 20 years – three years as Assistant Rector at St. John’s Episcopal Church in Sharon, and seventeen as Rector. That’s quite a career, especially considering the fact that he didn’t start studying for the priesthood until he was 43 years old, after completing a twenty-year career in the United States Air Force. After graduating from high school in 1960, he studied at Buffalo State Teachers College, then went on to get a Master of Science in Secondary Education from Fredonia State Teachers College. That career path took a little twist because of the Vietnam War. His Air Force Specialty was, appropriately, Education and Training. After assignments at Lackland and Hamilton Air Force Bases, he was sent to Nha Trang Airbase in Vietnam as education and training adviser to the Vietnamese Air Force’s 2nd Air Division. U.S. advisers worked one-on-one with a Vietnamese counterpart. To be successful, the two had to develop a trusting, friendly relationship. After returning from Vietnam, Major Dayton taught four years at the United States Air Force Academy in Colorado, then served at Wright-Patterson AFB, Ohio. 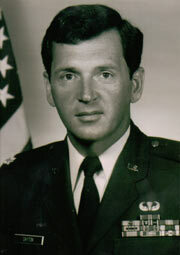 Before retiring as a Colonel, he served as Professor of Aerospace Studies for the Air Force ROTC Detachment at Grove City College. And that left him ready for his career as a pastor and priest. Fr. Dayton and his wife Kathleen have two adult children, Rachael and Aaron, and four grandchildren: Darius, Lucia, Parker, and Zoe.